Home > Blog > tech > Is nTouch Mobile Relay for the Deaf Worth It? Sorenson Communications has announced two products that will help deaf people who sign to communicate with their deaf and hearing friends on the go. The products, ntouch PC and ntouch Mobile, turn laptops and cellphones into videophones with the same Video Relay Service technology now used by deaf individuals to place calls. With Video Relay, a deaf caller can face the video screen and sign a conversation to a hearing operator who also knows sign language, who “relays” the information verbally to the hearing caller and vice versa. Sorenson’s hope is that calllers will be freed from having to sit at home using their proprietary videophone, VP-200, to make calls. 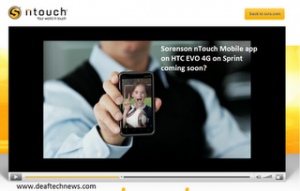 Sorenson has a lot to gain from ntouch. As the largest provider of video relay services, Sorenson reaps funds from the government to provide video relay services. The Federal Communications Commission requires equal access to telecommunications technology for people with disabilities, and reimburses Sorenson — the funds come from a telecommuncations tax levied on consumers. Still, with more smartphone apps turning mobile devices into video cameras, Sorenson has some stiff competition. Take FaceTime, an iPhone app that lets two deaf callers who have an iPhone 4 communicate in sign to one another, without the use of a relay operator. If they need assistance, they can dial up ZVRS, a company that Apple has partnered with to provide video relay services. Sorenson’s ntouch is a software program and won’t work on the iPhone; instead it is compatible with the Android mobile HTC EVO phone on the Sprint network, with features that include e911 and myRumble, which lets users set special vibration and flash patterns for different callers. Watch the ntouch Mobile video. Also, Sorenson competitor Purple Communications, recently launched ClearCaptions, a free real-time telephone captioning service for laptops and mobile phones. ClearCaptions also relies on an relay operator who lives behind the scenes, translating a person’s verbal conversation into text on-screen so the deaf or hard of hearing person can read it in real-time. Still, this service makes mistakes — it’s only human, after all. Sprint’s WebCapTel offers a similar service to ClearCaptions, but neither are video-based, which is key for those who prefer to converse in their native sign language. However, to acquire the ntouch software you must first qualify as a deaf or hard of hearing individual who uses American Sign Language, and purchase the HTC EVO phone with a Sprint data plan. And with the myriads of other ways that deaf people can communicate, including Skype, email and text, is ntouch worth taking on the burden? For those who are loyal to Sorenson’s services, however, the new ntouch services will indeed give callers more freedom. It’s just too bad that ntouch doesn’t have any flexibility to work on different platforms or devices, though the company says deals with more mobile providers are coming soon. Sorenson is a bit late to the game…and I reviewed the product on their website…apparently it is not available for downloading. You have to apply for it and have a trainer come to your home to install it….bleh. I can understand the need for a trainer if you aren’t technically inclined, but for people like me..that’s a deal killer. Z4 Mobile from ZVRS just came out for iPhone 4 and iPod Touch 4…it’s awesome! Different from the ZVRS app itself as Z4 Mobile is a stand alone program that does not require a WiFi connection like FaceTime does. I have no interest in Sorenson products at all. What’s more if you have to reformat your PC, you have to wait for them to come back to reinstall for you. The other provider’s are so easy to reinstall. Why do they have to make it so headache!!! from what I understand is that clear caption also allow a person to listen to over the phone. It is somewhat similar to VCO tty phones, except I am not sure if VCO tty phone or Captel allow deaf people listen (using hearing aids or cochlear implant) to the person who is speaking to them and use captioning as a backup, but I do know that it allowed them to speak to the person instead of using the relay service speak for them. other than that, I think sorenson Ntouch will be no different from ZVRS for Iphone or even other VRS (video relay service) apps for iphone or any smartphone with front-facing camera.